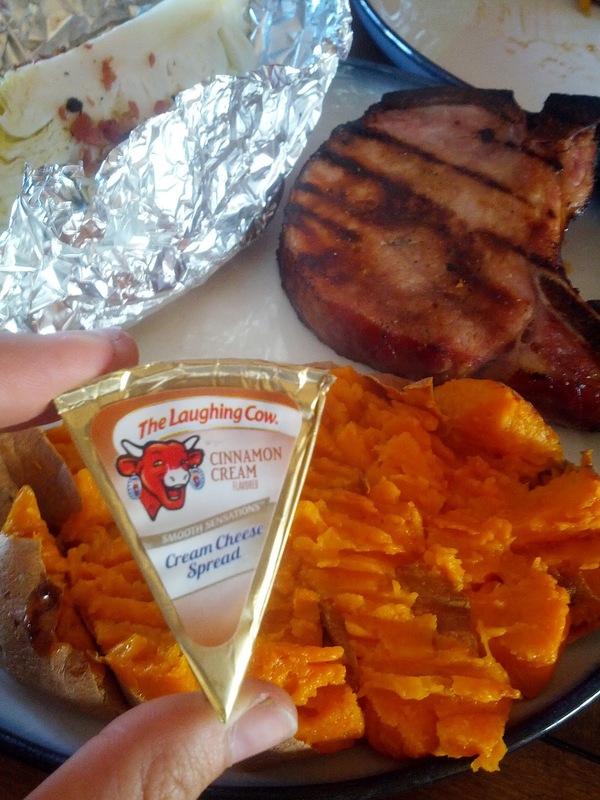 In this installment of "Dining with the Nobilings", I introduce you to The Laughing Cow cheese. You may have already had Laughing Cow cheese, like I had. But I was not aware that they made Cinnamon Cream Laughing Cow cheese on top of their other, more savory flavors. This wouldn't mean much to me, if it weren't paired with a sweet potato. I'm not big on cinnamon, or sweet cream cheese for that matter. But if I can have a fan-flipping-tastic tasting baked sweet potato with this stuff for 30 calories (yeah, you read that right...THIRTY) rather than slathering it with butter and brown suger per usual, then I'm all in! I gave you the recipe for the grilled cabbage yesterday. Now get to Fareway to get some smoked ham, and bake yourself a sweet potato (you can use the microwave, crockpot, or oven for this). You're all set for a full, healthy meal now that you've got the Laughing Cow Cheese in your corner...and seriously, Main Man talked about this food the whole way home. And the next day. I wouldn't lie about something so serious.